An ancient stick insect species may have mimicked plant leaves for defense, according to a paper published in the open-access journal PLOS ONE on March 19, 2014 by Maomin Wang, from Capital Normal University, China and colleagues. Many insects have developed defense mechanisms, including the ability to mimic the surrounding environment. Stick and leaf insects mimic plants from their environment, but scientists know little about the original of this interaction due to little or no previous stick insect fossil records showing this adaptation. 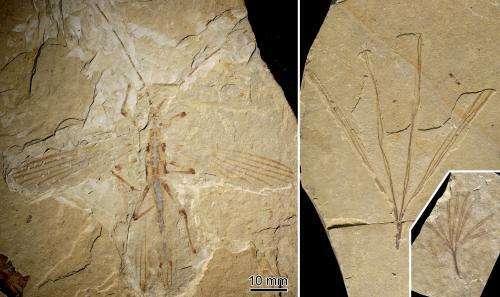 The scientists discovered three specimens, one female and two males, belonging to a new fossil stick insect referred to as Cretophasmomima melanogramma, in Inner Mongolia at the Jehol locality, a site from the Cretaceous period (approximately 126 million years ago). The species possessed adaptive features that make it resembling a plant recovered from the same locality. The insects' wings have parallel dark lines and when in the resting position, likely produced a tongue-like shape concealing the abdomen. Fossils from a relative of the ginkgo plant have been documented in the area with similar tongue-shaped leaves along with multiple longitudinal lines. The authors suggest the insect used this plant as a model for concealment. The new fossils indicate that leaf mimicry was a defensive strategy performed by some insects as early as in the Early Cretaceous, but that additional refinements characteristic of recent forms, such as a curved part of the fore legs for hiding the head, were still lacking. The new fossil suggests that leaf mimicry predated the appearance of twig and bark mimicry in these types of insects. The diversification of small-sized, insect-eating birds and mammals may have triggered the acquisition of such primary defenses.